I still have the TV Life series on the individual Shiyagare segments left to do (and promise to finish), but I couldn't resist translating this one first because it's an interview with the producer for Aiba Manabu. I always love hearing what the staff they work with have to say about the members and this is no different, especially considering Aiba Manabu is my favourite solo program of the group. It's also really interesting to see how he says some very similar things to what the Shiyagare director for Aiba's segment had said previously. Feel free to leave a comment with your own thoughts. Enjoy! Aiba Masaki's first starring variety show will soon be headed towards its fourth year. With "Revitalizing Japan!!" as its motto, what's it like behind the scenes of this show which seeks to convey the unknown magnificence of Japan? With a hand in numerous shows, he currently produces "Aiba Manabu" as well as "Ichi kara juu ~zenryaku, ijuushimashita~" which airs every Sunday evening at 6:30. "Aiba Manabu" has almost aired for three full years since its start. Its first episode in 2016 was a first-ever special for the show which sees them continuing to tackle new exciting challenges. In order to find out how "Aiba Manabu" will turn out from this point on, we've approached Takahashi Nobuyuki, the producer of the show. Takahashi-san had actually worked with Aiba Masaki once before in the past. "We worked together on the drama 'My Girl' before. I'm sure he was nervous because it was his first starring drama, but I remember thinking to myself how he really is a wonderful person after seeing the way he was always taking what he should be doing as the lead of the team into consideration while he was on the set. And when we reunited for 'Aiba Manabu', the consideration Aiba-san showed for those around him and the way he energized the entire set was just fantastic. I got the sense that he had become an even more amazing person after taking in different experiences and had become even cooler than before. He used to have this cuteness about him in the past, but 'cool' has really become a fitting term for him now. Even as a guy myself, I'm enchanted by him when I watch him at work (laugh)." One particular aspect to his attentiveness truly highlights Aiba's warm and genuine personality. "He pays attention to all of the staff irregardless of their position or occupation. I'm sure that in his mind, Aiba-kun thinks of them all as fellow colleagues who are working together with him. Normally, it's not common for the stars to talk to the younger staff on set, but Aiba-kun actually goes out of his way to strike up conversations with young ADs. I think it becomes a significant source of motivation for the young ones, and it also boosts morale during shoots. The same goes for Watabe (Ken)-san and Sawabe (Yu)-kun. It's honestly so much fun on set, and everyone on the team are always looking forward to the next shoot." It's true that whenever we pay a visit to report on a "Aiba Manabu" shoot, they're always all smiles and going about their work with a lot of energy. We're sure that serves as the driving force which leads to their new projects. "We basically have a weekly meeting where us staff take the ideas provided to us by the writers and sit down to have a discussion, figure out how many of them should be picked up as program topics and then begin researching. After researching and hunting for locations to a certain extent, we present the results in the meeting and announce which ones we think are doable, and then decide which ones we'll do or won't do. The theme of our show is to 'learn' about Japan, so we're always keeping in mind which topics match the current period of time, what sort of scenery is unique only to that particular season, or just things that have never been done before. But among all that, we also have a few topics that were born purely from the perspective of wanting to see Aiba-kun do certain things as well. Further taking the overall balance into consideration as we construct the episode line-up is the usual way of doing things. One thing we're very grateful for is despite being such a busy person himself, he's always giving his all even with the tougher shoots or the topics with bigger workloads. That's precisely why we keep coming up with all kinds of different projects. We still have many topics in stock, though they haven't taken shape as yet." And it seems they don't disclose the project details to Aiba until one or two days before filming. "We don't actually explain the details to Aiba-kun until the day of the shoot. If we tell him you must say this or you must do that, it ends up feeling too planned and we lose the freshness of that first reaction, I think. That is why we try not to give him too many details and pretty much only disclose the general gist." Up until now, they've produced numerous famous projects and series, but it comes as no surprise that the show's first-ever one-hour special left a deep impression on Takahashi-san. "In the beginning, we were actually thinking of doing a special based on our ekiben series. But once we gave some thought on doing it for real, we realized that traveling down the Arakawa river gave us more to work with. We can go gather ingredients, go fishing, and also go visit nearby factories. Speaking of which, the day we had originally set for the location shoot to take place was supposed to have really bad weather, so we had to move the date forward at the last minute. But in the end, the day on which we set out for the shoot turned out to be extremely cold... the original planned date was actually a bit warmer (laugh). From what I remember, it was the coldest day of this winter season. We were in a boat filming them going down the river, but I'm sure Aiba-kun and the others were even colder considering they were closer to the river than we were. Not only that, it started raining in the middle of the shoot... but he pulled through for us despite the harsh conditions. His sense of professionalism is incredible. Now that I think about it, never once has Aiba-kun ever told us he can't do it, or that it's impossible." Furthermore, Takahashi-san analyzes Aiba's appeal in variety shows as such. "No matter which show he's in, he always has a strong presence as Aiba Masaki. I'm sure there's a large number of people among the viewers who wish to see 'Aiba-kun as he is', but Aiba-kun himself isn't being manipulative or purposely acting a certain way because he knows that's what they want to see. He's very consistent, yet he's able to bring some variation as well. Among all that, I think he gives off an even more natural sense about him whenever he's on 'Aiba Manabu'. He's very candid about his emotions, so he'll say it's cold when it's cold, hot when it's hot, or yummy when it's delicious. As a whole we have quite a few difficult projects (laugh), but I'm sure he's being genuine when he's working on them. I also feel that more than anyone else, he understands what to do in order to make 'Aiba Manabu' an interesting show and works to make it happen." The teamwork among the stars with Aiba at the core of it is also unique to this show. 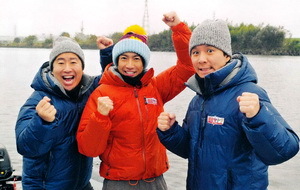 "There is a really good sense of camaraderie among Aiba-kun, Watabe-san and Sawabe-kun . Above all else, they get along very well, so I hope that won't change and they'll continue to joke around like that (laugh). When the three of them are joking and smiling, it influences those who are watching to smile along with them. And on the production end of things, we hope to come up with more and more topics with new things to learn. Not just ones that make you think 'That was fun' or 'That looked delicious', but things that make you marvel and think, 'Today's topic was interesting, I really learned a lot'. I hope to produce a show which delves deeper yet presents information in an easily understood manner so the viewers can vicariously experience for themselves. Simultaneously having this "Aiba Manabu-esque" feel that we're able to establish by virtue of having Aiba-kun with us as well as a "Aiba Manabu-esque" feel stemming from the show's contents is the next challenge for us to tackle."